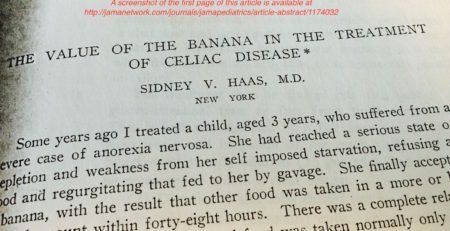 Long before gluten was identified as the culprit in celiac disease, a doctor by the name of Sidney Haas in New York City was treating pediatric patients using what came to be known as the “banana diet.” A former patient of Dr. Haas contacted me in 2008. She very generously and graciously wrote down her recollections of the banana diet (these recollections were originally posted on glutenfreedietitian.com). I am also a “banana baby”. 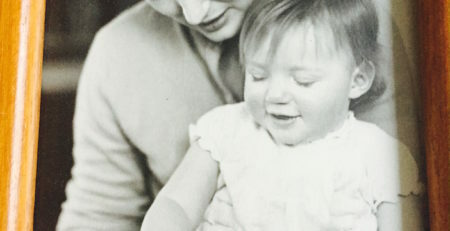 I was born in 1947 & at 6 months old (when babies get wheat cereal) I became very sick. For 3 months, I was constantly sick & nearly died. A new doc came to town & took one look at my emaciated body & had only seen 1 case in med school. Diet of bananas & rice for 18 months. They thought I would outgrow it. I was sick in my childhood, but came back with a vengeance at age 30 after pregnancy & diagnosed properly. I love bananas still. Thanks so much for sharing, Peggy! Oh Peggy and any one else who was a banana baby, I would love to get in contact with you and compare notes. I was a banana baby back in the 1940s as well and I have quite a story, as I am sure you do. I’d love to hear your full story. I did send a note to Tricia and she led me to your comment. Is there some way we could talk or email? Thank you both for sharing. Your experiences are valuable. 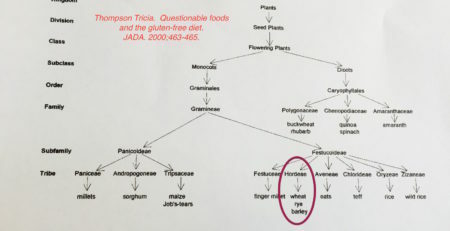 I’m wondering about the fact that banana babies were converted to a regular wheat-containing diet after several years. 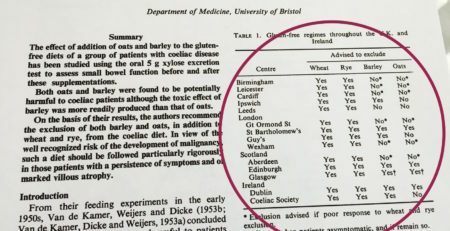 Did you regularly eat wheat after being told you were “cured”? Did you have symptoms? There’s growing awareness that celiac has so many symptoms beyond the typical gastrointestinal ones, and that severity varies with individuals and is not necessarily determined by the stage of life, and your experiences shed light on that. Very interesting. I never heard of banana diet, but have a similar personal experience. Like the author’s child, I was a sickly infant, losing weight and turned green and vomited after feeding. This was in the early 1950’s. No one in my family had any known GI problems. It is not clear if I did OK for the first few months of my life and this just began when I was a few months old, or if I was like this immediately after birth. I do know that when I was several months old, I was so sick that my mother escalated my care and took me to a very respected senior pediatrician at some distance from our home. Using clinical judgement only, this senior physician said there was something wrong with my liver, and that I should be fed soy milk and nothing else. Soy milk was not readily available in stores then, and this required my mother to buy the beans, cook them ( with the pronounced smell permeating the house), and prepare the milk. She did this, and I began to stop vomiting and finally gained weight. After many months, rice cereal was added to the milk. I still did fine. Gradually other foods were added, and although I was small and skinny (unlike my sister), I did grow. From time to time, we visited this doctor throughout my childhood. When I had one of the infectious diseases that all children at that time got, I had a “recurrence” of my GI problems, and had to have a “soft” diet ( chicken soup, toast, cottage cheese) until the recurrence subsided and then I returned to a normal diet. I was like this my entire childhood. Even when I was “well” during my childhood, it was not easy for me to eat, and the same eminent physician suggested I eat in a quiet area by myself without a lot of commotion. I passed my childhood this way. Once adolescence started, these problems seemed to be resolved, and I never saw the pediatrician again. 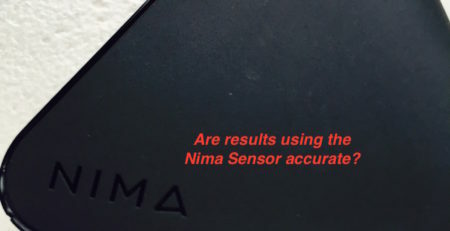 At age 50, I self-diagnosed celiac disease, was tested….and yes, I was right. 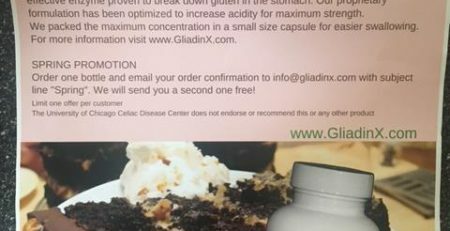 Looking back, I realize the soy milk diet saved my life and allowed what was probably celiac related hepatitis to clear. Its not the banana diet, but I thought I would share. Interesting too, that at that time we children with known digestive disorders were regarded as “cured” once we passed through childhood. Thank you so very much for sharing your story, Sue. Goodness, what you went through as a child. I am usually full of words, but the stories shared by you and others make words seem inadequate. Hugs to you. They treated me for free as my family was very poor. 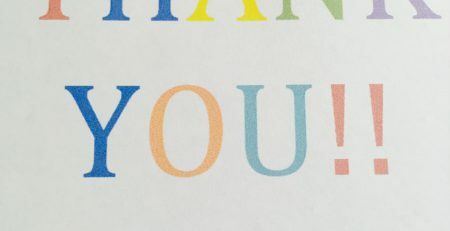 Hi Roger, Thanks so much for taking the time to comment and share your experience with Dr.Haas. I’m assuming by completely cured that you mean by diet and that you are still following a gluten-free diet. Wow this article really resonated with me. I found it from the other article about the impact of the banana cure. I was diagnosed with celiac disease by the Hospital for Sick Children in Toronto in 1957. I was almost one year old and had been very ill since I was weaned. I had projectile vomiting and diarrhea. My mother said I looked like a child of famine with stick limbs and a swollen stomach. I was suffering from malnutrition and near death when I was admitted to the hospital. I went home eventually and was put on the “banana diet”. My mother said the main part of my diet was bananas. I have always wondered about that and now understand the history of this treatment. She told me she had to travel across the city by bus to the hospital to pick up a special cereal for me. I was constantly starving according to her and one day I ate a crust that had dropped on the floor from a sibling. I didn’t have any symptoms so she took me to the doctor who pronounced me “cured” and that I could now eat anything! I had so many health problems as a child, teen and adult. Severe rashes, constant stomach aches, constipation, cystic acne, several miscarriages, numerous colds…the list goes on. 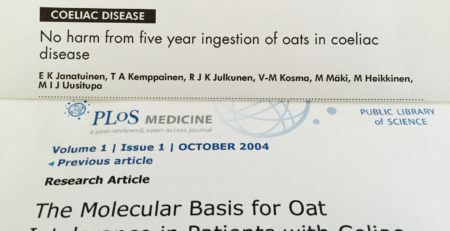 I had mentioned to doctors that I had had celiac disease as a child but not one discussed the implications of this. 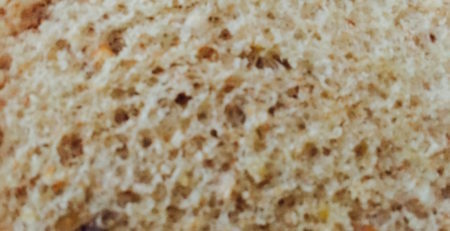 In my mid 30s I started reading up about celiac disease…my mother had always talked about her experience of being a mother of a baby with celiac etc etc. 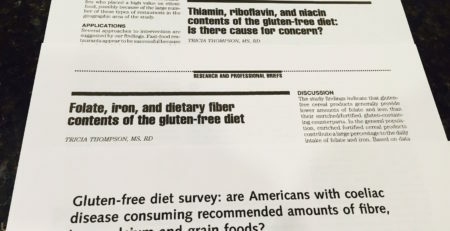 I was shocked to read that it was now considered a life long disease so I began to eliminate all gluten from my diet. This took me a while to get used to but eventually I came to realize that eating gluten caused me a lot of physical problems. My parent split up when I was 3 and I have often wondered if the strain of dealing with my disease as a young child with two other children was the last straw for my poor mother who was mislead about the cause and treatment. I would say the belief that bananas cured celiac and that children outgrew the disease had very serious implications for families and is so unfortunate. Thank you so very much for sharing your story, Joanne. Hugs to you.